As farm incomes decline and financial conditions erode, concerns about farmers’ ability to repay farm debts mount. The Kansas City Federal Reserve Bank provides great insight into the health of the farm economy – and specifically farm loans- through its Ag Finance Databook. This post considers the latest farm loan delinquency data and evaluates conditions at the end of 2016. The Kansas City Fed publishes two categories of farm loan delinquency data: non-real estate and real estate. 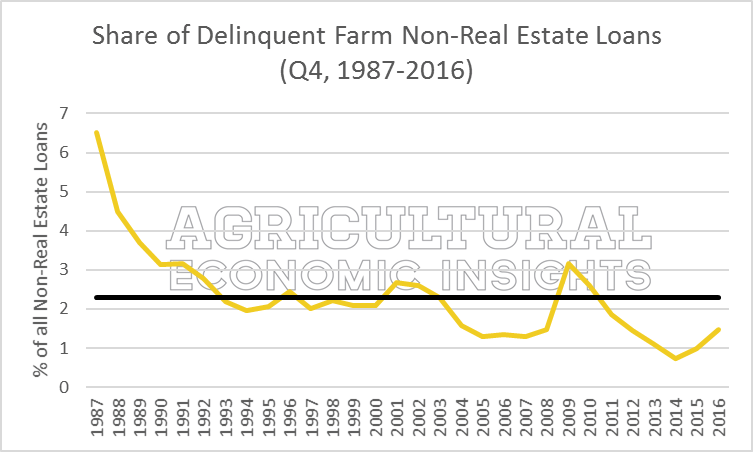 In figure 1, the share of non-real estate farm loans reported as delinquent in the fourth quarter of each year since 1987 is shown. Over the last 29 years, the average delinquency rate was 2.29%. Rates in the late 1980s and early 1990s were considerably higher than this long-run average as the sector recovered from the farm financial crisis of the early 1980s. Delinquencies also jumped in the early 2000s and in 2009/2010. 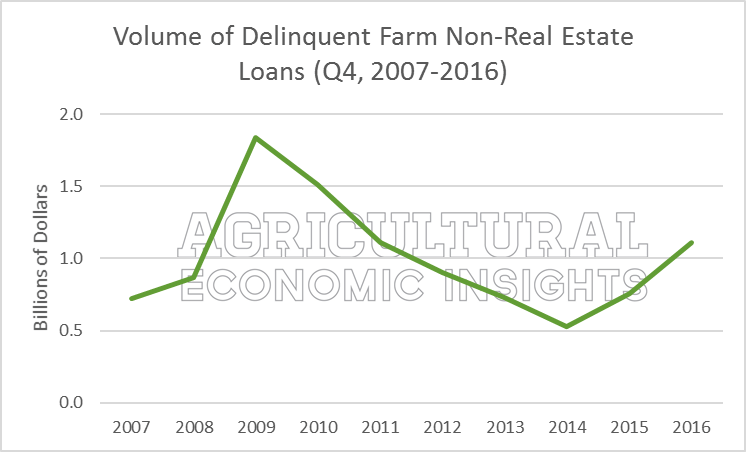 In the fourth quarter of 2016 (the most current data), 1.47% of all non-real estate farm loans were delinquent. This is up from 0.98% in 2015 and 0.72% in 2014. In fact, the share of delinquent non-real estate farm loans more than doubled in two years (from 0.72% to 1.47%). On the other hand, current delinquencies remain below the long-run average (2.29%) and are lower than the previous uptick in delinquencies (3.08% in 2010). Importantly, the unfavorable trend of higher loan delinquencies has been from historically low-levels. Figure 1. Share of Total Farm Non-Real Estate Loans Delinquent – Debts Held by Insured Commercial Banks. Data Source: Kansas City Federal Reserve, Ag Finance Databook. 4th Quarter, 1984-2016. Mean: 2.29%. A second measure for considering the scale of farm loan delinquencies is the volume of delinquencies. The volume of non-real estate delinquencies has also turned higher since 2014 (Figure 2). At the end of 2016, $1.11 billion dollars in non-real estate loans were delinquent. While 2016 levels are more than double those in 2014 ($530 million), current levels remain lower than the $1.84 billion of delinquencies in 2009. Figure 2. Volume of Total Farm Non-Real Estate Loans Delinquent – Debts Held by Insured Commercial Banks, Billions of Dollars. Data Source: Kansas City Federal Reserve, Ag Finance Databook. 4th Quarter, 2007 -2016. 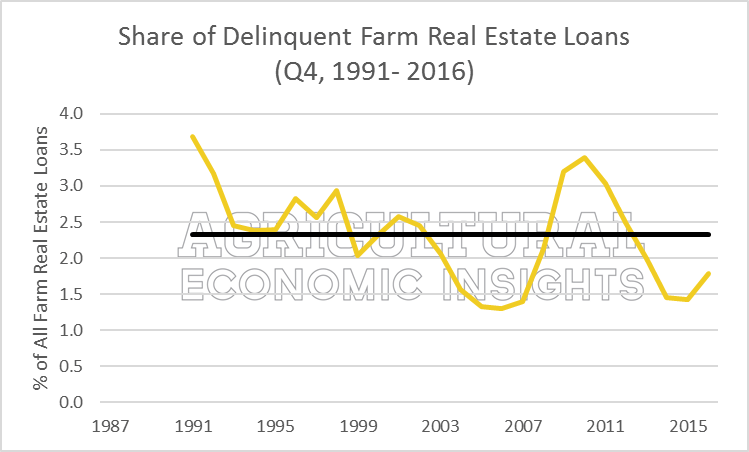 In figure 3, the share of delinquent farm real estate loans is shown for the fourth quarter since 1991. After resisting an upward turn in 2015, the share of farm real estate delinquencies increased in 2016 to 1.78%, up from 1.42% in 2015 and 1.25% in 2014. Like non-real estate loans, the share of real estate loan delinquencies in 2016 was below the long-run average share (2.32%) and considerably lower than levels reached in 2010 (3.4%). Figure 3. Share of Total Farm Real Estate Loans Delinquent – Debts Held by Insured Commercial Banks. Data Source: Kansas City Federal Reserve, Ag Finance Databook. 4th Quarter, 1991-2015. Mean: 2.32%. 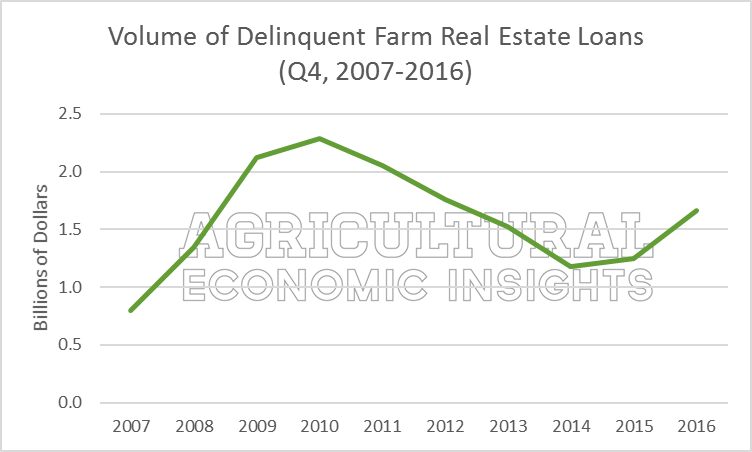 When considering the volume of farm real estate loan delinquencies (figure 4), another uptick in 2016 was observed. Specifically, farm real estate loan delinquencies were at $1.66 billion in 2016, up from $1.25 billion in 2015 and $1.18 billion in 2014. While both have trended higher since 2014, the magnitude of increase in delinquencies volumes has varied from non-real estate and real estate loans. From 2014 to 2016, the volume of farm real estate loan delinquencies increased 41% (from $1.18 billion to $1.66 billion) while the volume of non-real estate loan delinquencies more than doubled, up 109% ($530 million to $1.11 billion). Figure 4. Volume of Total Farm Real Estate Loans Delinquent – Debts Held by Insured Commercial Banks, Billions of Dollars. Data Source: Kansas City Federal Reserve, Ag Finance Databook. 4th Quarter, 2007 -2016. While the share of farm loans delinquencies increased for both loan types in 2016, it is important to keep in mind that 1) the uptick has been from historically low levels, 2) current levels are below the long-run averages and levels reached in 2009/2010, and 3) current levels are well-below delinquency rates reported throughout all of the 1990s. In other words, the uptick is noteworthy and reflective of generally difficult financial times in prodcution agriculture, but the scale is important to consider. A caveat to keep in mind is how fast conditions can change. From 2008 to 2009, the share of non-real estate farm loans that were delinquent more than doubled – increasing from 1.48% to 3.15%. Early 2017 USDA estimates reveal another year of lower farm income and deterioration of farm financial health is likely. While that early estimate will be subject to many factors throughout the growing season (yields, prices, costs of production, etc. ), should 2017 be another difficult financial year for U.S. farms, rising farm loan delinquencies will likely continue. Finally, take a look at the Kansas City Fed’s latest summary of farm lending conditions.